Yuri Suhl book is plain literature and the author had the freedom of imagination. 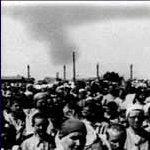 To drown out the pitiful cries of the victims, the Germans at Sobibor kept a flock of geese [!] which were made to quack (or whatever noise it is that is made by geese), very loudly, whenever the blackish substance was introduced (10). 9) Alexander Pechersky, La rivolta di Sobibor, in Yuri Suhl, Ed essi si ribellarono, Milan, 1969, p. 31. Now, what first impression does the above passage convey? That Pechersky was an eyewitness to this method of extermination. Since the method as described is obviously bogus, Pechersky must be a liar. I read all of Pechersky's writing and also twice personally interviewed him. He never claims to see inside the gas chambers. Yuri Suhl book is plain literature and the author had the freedom of imagination. No Jew who was once inside the gas chamber in operation come out alive. The information about the gassing installation came from the accused Nazi testimonies in the court proceedings. Second hand stories are many times deceitful. I myself find my story completely rewritten and unrecognizable in Miriam Novich book about Sobibor. Makes sense, doesn't it? Especially if we consider that Pechersky never was in the extermination part of the camp, Lager III. On the evening of the fifth day we arrived at a small deserted station. A white sign in big gothic letters read SOBIBOR. About eighty men, most of them prisoners of war, stepped forward. I was among them. We were forced into a yard fenced off by a barbed wire. From there we were led to a barracks with barren bunks and ordered to take our places. All the others in the transport remained on the other side of the fence and we never saw them again. A short, stocky Jew sat down near us. He was about forty years old. He had just returned from work in another yard. 'Where are you from?' he asked me in Yiddish. The air was full of the sharp smell of something smoldering. 'What's burning there?' I asked. He was an old-time inmate who worked at sorting out the clothing of those who were killed. He was well informed. From him we learned where our comrades had disappeared and how the whole thing operated. So what do we have here? Pechersky's description is not only hearsay, it is at least second-hand hearsay. This is crucial both for judging of Pechersky's credibility, and for the whole argument about "unreliable" Holocaust testimonies (lurid rumors and second-hand hearsay don't establish anything about eyewitnesses' credibility, as "broken phone" principle is at work - information is often distorted as it is being passed from one source to another). But Graf omitted this crucial fact, destroying any credibility he might have ever had. That he can attempt to use this hilarious crap in support of his beloved 'holocau$t' simply confirms his Nutjob status. It simply highlights the types of people who, when confronted with rationality and science presented by Revisionists, withdraw into their Bizarro World. No Jew who was once inside the gas chamber in operation come out alive. First of all, the moronic 'gas chambers' claim has been thoroughly demolished. Anyone who doesn't believe can debate us here. Nutjob Sergey Romanov has, and certainly regrets it to this day. Check it and see. I mean these 'holocau$t' wackos simply cannot keep their lunatic stories straight. Over & over they stumble over their own lies. There were no 'gas chambers', the '6,000,000' is laughable, there are no mass graves as alleged. It's that simple. It's interesting because Romanov agrees that Pechersky's claims are not believable, and the way he tries to get around that is by saying the holocaust writers lied about what Pechersky said. The problem is that Pechersky wrote his own book which had the problematic comments. Mazal has a whole library of holocaust books, but offers Romanov a book that he just discounted in the previous paragraph. The only way it could have been worse is if Mazal offered Romanov a Leon Uris book! No Jew who was once inside the gas chamber in operation come out alive. The information about the gassing installation came from the accused Nazi testimonies in the court proceedings. And then follows up with his own comment, "Makes sense, doesn't it." Filip Müller, Auschwitz Inferno: Testimony of a Sonderkommando, Routledge & Kegan Paul, London 1979. So Romanov has never seen Shoah (1985) by Claude Lanzmann where Abraham Bomba talks about being inside the gas chamber on DVD disk 3 chapter 2? Sergey and Andrew Mathis share the same thoughts. Yet Mathis claims he's going to debate someone on gas chambers, LOL. This is yet another of the seemingly endless stream of examples of selective quotation of sources, depending on which one fits the argument at hand better. Witness Lengyel quoted 1.3 million gassed at Birkenau in 2.5 months time, yet these guys have stated that they do not believe such claims, although Lengyel's source is a Sonderkommando physician (if he ever existed) who himself was claimed later murdered. On RODOH's team debate section, the Veritas team captain stated that Vrba's admission of false witness (euphemistically referred to as poetic license) didn't apply to the WRBR and therefore Vrba remained a legitimate witness, because, the Veritas team said, Vrba's memoirs were literature and in literature you are allowed poetic license. Something tells me this argument wouldn't be acceptable among Jews if a Palestinian author admitted to lying about Israeli atrocities in one book and this man's supporters merely ignored this one book and quoted others by him with similar tales. These guys want us to accept as legitimate so-called historians who use debunked sources such as Filip Mueller, who is a known plagiarist and teller of tall tales. Mattogno absolutely destroyed Mueller, yet not only is he taken as a legitimate witness among the RODOH bunch, but also 'historians' such as Bauer, Hilberg, Van Pelt, and God knows who else. It's not like any of these people have attempted to respond to Mattogno's article, they simply ignore it and keep quoting this guy. Then these clowns sit confused as to why we take such 'historians' with a grain of salt! Once a source is exposed as fake and writers keep using him, aren't the writers that keep using it exposed as fake, too? Isn't that what these guys are always accusing Revisionists of doing? The answer whether or not using debunked witnesses is acceptable depends upon the ethnicity of the witness and those who quote him. SirGay Romanov & Co's main objective at RODOH/HolocaustControversies seems to be lobbing ad hominem at people after erecting a Nazi strawman and beating it madly. I think that they intentionally play dumb at times when it serves their advantage and quietly wait and see if someone calls their bluff. Sergey Romano used to post on this forum. The man was booted off the forum when he lost his cool and abused people who did not agree with his views on Babi Jar. He joined the AHF where the moderator, a David Thompson, stroked his wounded ego. He joined Roberto and nickterry in an effort to discredit Mattogno, who apparently presents in the eyes of the Holocaust promoters a threat to their newly found Holocaust religion. Bizarro Sergey Romanov has also been caught trying to defend the human soap and human skin lampshades stupidity. No joke. Revisionists are dealing with what are essentially cult members. Their irrationality knows no limits. It's a wonderful thing having truth on our side, something the absurd 'holocaust' cultists are in denial of. Hannover wrote: Bizarro Sergey Romanov has also been caught trying to defend the human soap and human skin lampshades stupidity. No joke. Wow, I didn't know anyone defended that trash anymore. I'd like to see SirGay duke it out with Lipstadt over this one. Maybe he just realizes that if he were to admit that these two things were not true, then he'd be faced with admitting that both the USSR and USA introduced government authentication certificates which are false. I haven't read Lipstadt but I really doubt she addresses why she says the lampshade thing isn't true in spite of American documents of authenticity. And don't forget about the long haired 'shrunken heads'. - Sobibor witness and ex-camp chef Herszl Cukierman claims to have smuggled a letter - hidden inside either a thick crust pie or a dumpling - into Lager 3 and received a written reply back, telling either that "here the last march takes place" and "here the corpses grow cold" or, according to another version, "You shouldn't have asked. They gas people and put them into mass graves." -Moshe Bahir also claims that the camp underground (presumably throught the aforementioned Cukierman) received several letters from the Jewish slave laborers in the "death camp", detailing among other things absurd greuel tales about magical blood stains and ears, cheeks and limbs embedded into the gas chamber floor so that floorboards had to be replaced. It was this fellow Sergey Romanov who posted on the other board in all seriousness, that the reason, why the remains of the hundreds of thousands of dead Jews who were allegedly killed in Babi Jar could not be found, was because the big flood came and washed it all away! What a clever "Holocaust historian"! They sure have some quality hoaxsters on that forum. Sergey Romanov told the AHF that he hails from Russia. He is probably an "Ostjude" (East-Jew) who are flooding at this time Germany by the hundreds of thousands, demanding full welfare instantly and hate Germans. I kind of stumbled into this CODOH/RODOH thing recently, although I dealt with Nick Terry and his inflated ego elsewhere on my own. When I was intially linked to the HC Blog, I looked through it partly thinking it may be a reference of sorts like Nizkor, where I could cross-reference and compare information. I later realized that at least half of all the posts on this blog are ad hominem/personal grugematches written by a group of men who seem to have quite an ego problem and thoroughly enjoy name-calling like so many children. They also seem to be absolutely obsessed by this board and those who post here. I decided to glance at the HC Blog, and I find that I have joined the esteemed list of those targeted by this group of scholarly, mature men. I'm truly flattered, even if this bunch are just bloggers with big mouths with an overly inflated sense of importance. It really amazes me how these guys respond similarly when presented with various points, almost as if it were scripted. Mr. Romanov has now responded nearly identically to Mr. Terry when presented with issues regarding the use of questionable witnesses by historians. That response, in a nutshell, goes something like this: "Well Rudolf bla bla bla, Mattogno yadda yadda yadda, Zundel blabber blabber blab!!!" The point is never addressed, and we are never told why its acceptable to use witnesses who have been discredited, caught plagiarizing or otherwise telling self-contradictive stories. Instead we stand there and watch pies being flung at various people. This isn't the response of a studied scholar, it's the response of a 13 year old on a school playground. No wonder I quit taking that bunch seriously. They also seem to be absolutely obsessed by this board and those who post here. They had their heads handed to them on each issue; scientifically, logically, the laughable 'documents', every way possible, so their only recourse, other than admit the folly of their ways, is to engage in ad hominem attacks. Of course, objective readers can see through that desperate tactic. Some examples for Sergey Romanov I have given. Sergey Romanov (hello Sergey! since you are reading this) claims that Biskowitz did not see the collapsing floor and that anyway it's "irrelevant since the collapsing was not the murder agent". He is lying. A. I did not see that ? I merely saw that underneath the gas chamber, there was a hollow which already contained bodies. Presiding Judge Thank you, Mr. Biskowitz, you have concluded your testimony. I know you have not told us everything. But there was no alternative. So what he claims that he did not see was the process of the floor opening up. What he claims he saw was corpses in a pit underneath the gas chamber. Which means that he claimed to have seen the floor of the gas chamber in its opened up state.